Generally sannyasa is understood as renunciation of the family to undertake a nomadic life with minimal possessions. Pujya Gurudev always emphasized on the deeper import of the word – renunciation of the ego, the ‘I’ and ‘mine’. Shedding the narrow and limiting identification with the body, mind and intellect, the enlightened one discovers his identification with the entire universe and all living beings. The negative aspect of renunciation is wiped out with this expansive and all-inclusive vision. Thus, Adi Sankara embraced sannyasa, left his mother and wandered all over the country to impart spiritual knowledge. But it did not mean that he stopped loving her. In fact, he came back to his native place to perform the last rites for his mother, against the dictates of orthodox tradition. Tradition is redefined by such great souls. Swami Chinmayananda was one such mahatma who held up the essence of the scriptures, discarding the encrustation of constricting and irrelevant customs. 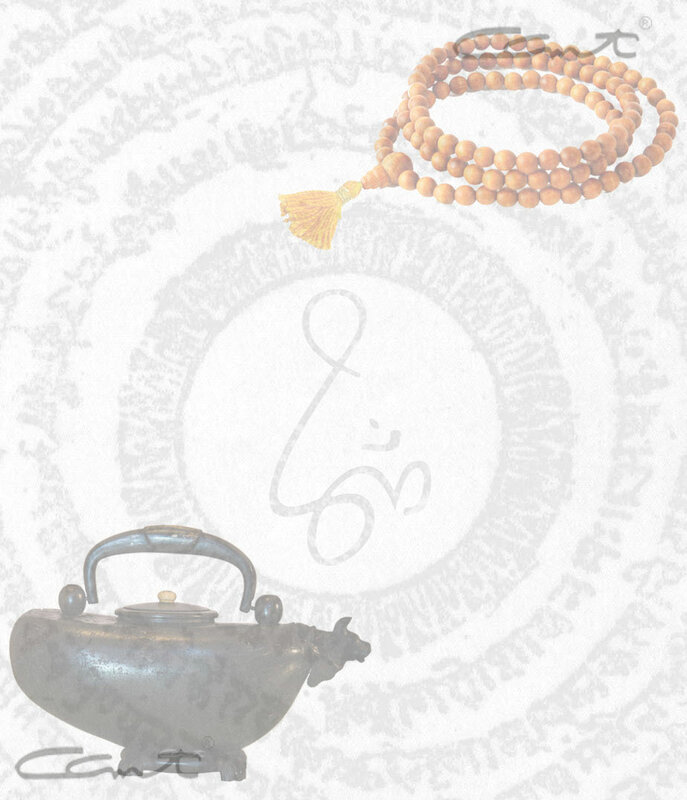 Even when he was busy conducting jnana yajnas in various cities, he kept in touch with his mother. He arranged for her to attend some of the yajnas and gave her spiritual advice. 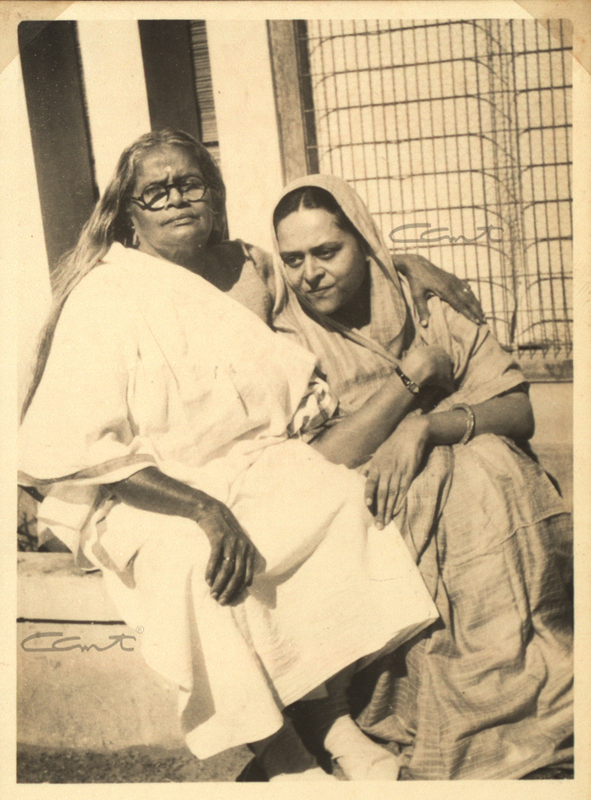 In the loving embrace of his mother during the sixth Jnana Yajna in Coimbatore from 09.05.1954 to 30.05.1954. 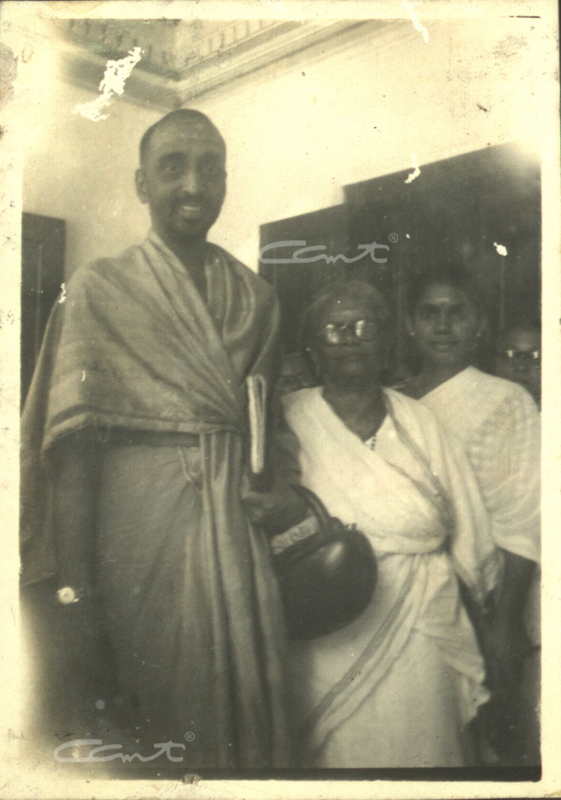 Pujya Gurudev with Kochu Amma, perhaps in 1950 during his visit to Poothampalli House. Having lost his biological mother at a very young age, Kochu Amma was the only mother Balan knew. She brought him up along with her children and lavished so much love on him that he firmly believed that she was his mother. In fact, when his father remarried and moved to Thrissur, little Balan refused to go with him. For the child, Kochu Amma was the mother and Poothampalli House the only home. 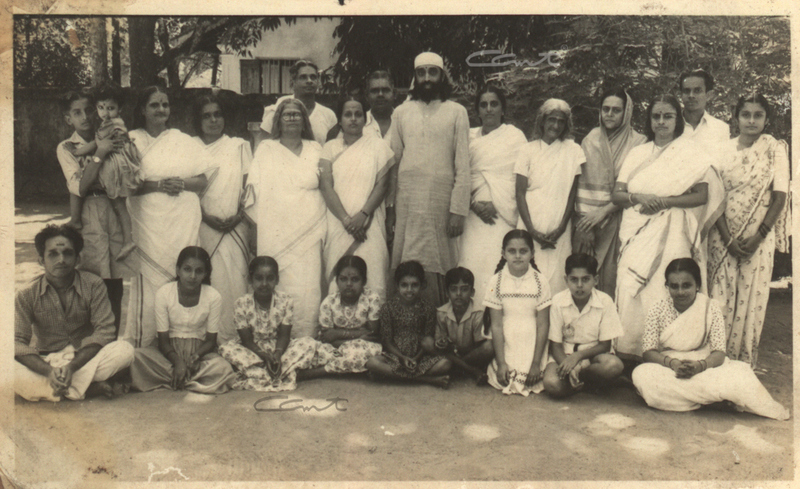 Pujya Gurudev with family members in Poothampalli House. 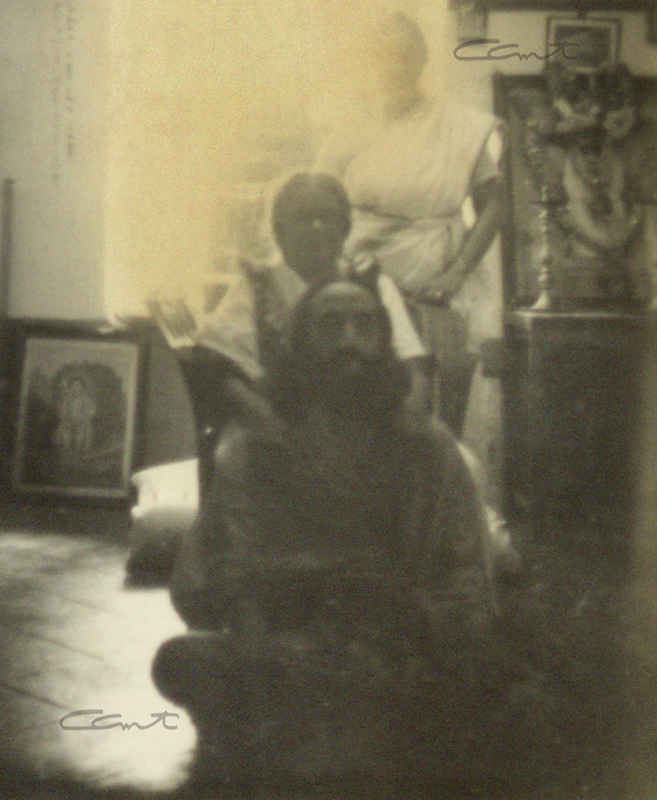 Pujya Gurudev in the Puja room in Poothampalli House, date unknown. 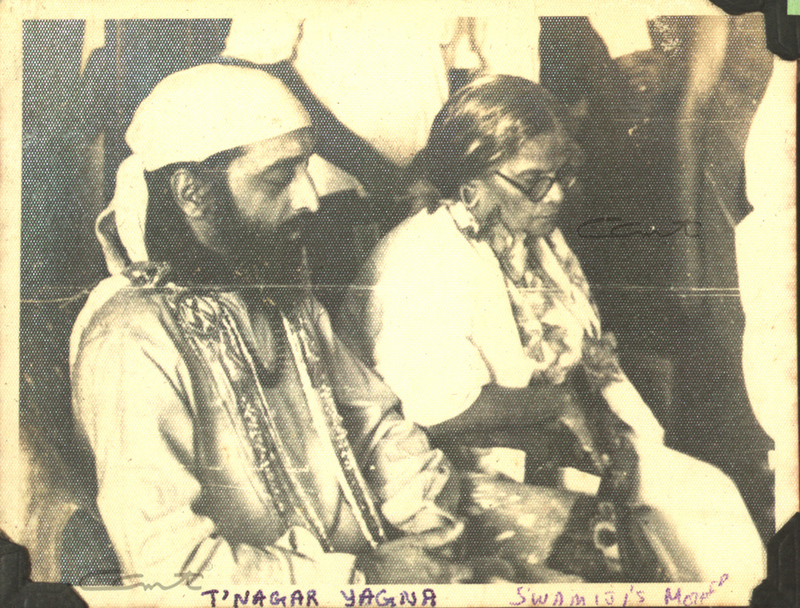 Even after receiving sannyasa diksha, Swamiji did not hesitate to express his affection for his mother openly. Where there is no attachment, love alone shines forth in its full glory. Whenever he visited the ancestral home, Poothampalli House, he would shower her with his love. During his childhood, his mother used to mix the rice with vegetables and other dishes and make rice balls, called urula, to feed him. In the later years, every time he visited her as a sannyasi, he highlighted his special bond with her by insisting that she give him the first morsel of food, the urula. Kochu Amma’s grandchildren (through Bhaskara Menon), Indira and Sarasa, recall those days. 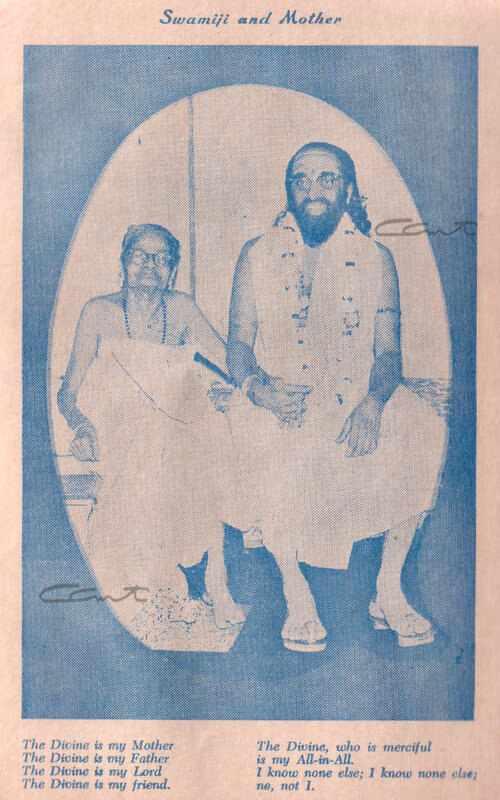 Pujya Gurudev with Kochu Amma in Chennai, date unknown. The son loved her immensely, but the mother also had a very special place in her heart for this unique son. Whenever he was to visit her, she would go into an overdrive, clean up the house personally, make special preparations and wait eagerly for him to arrive. As she grew older, she made her granddaughters do the cleaning up and Swamiji would play pranks on them. In spite of financial constraints, Kochu Amma would be ready with sadya (special feast food of Kerala) for her favourite son. And she would spend time with him, one on one, confiding in him about all her concerns, problems and worries. 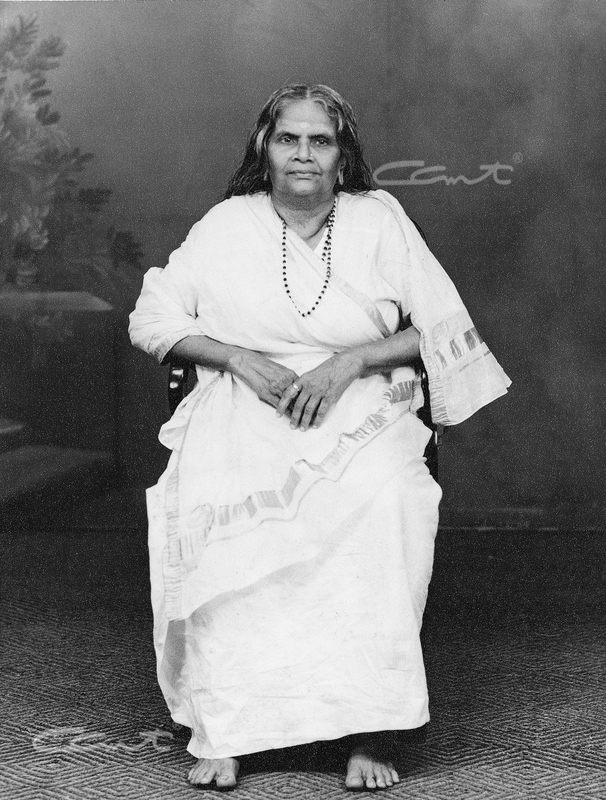 The famous studio picture of Kochu Amma is very special because Swamiji made her wear the traditional Kerala two-piece saree known as kasava mundu, took her to the studio himself, arranged and adjusted her clothes and hair for the picture to be taken. 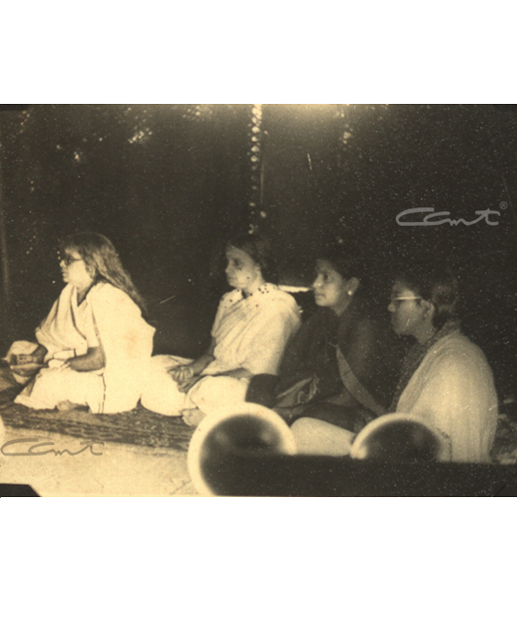 Kochu Amma and her sister Kutty Paru Amma attend the sixth Jnana Yajna in Coimbatore from 09.05.1954 to 30.05.1954. 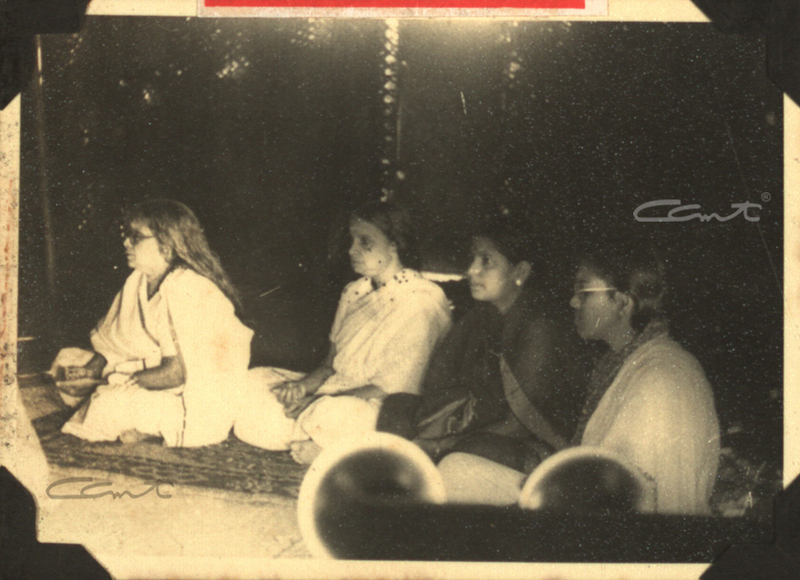 Kochu Amma and her sister Kutty Paru Amma seated in the middle of the audience during the 14th Jnana Yajna in Delhi from 30.10.1955 to 30.11.1955. Swamiji used to give spiritual advice to Kochu Amma periodically, telling her to do japa etc. She followed these instructions scrupulously. She began to observe mauna in the mornings regularly. Gita chanting became an integral part of the puja, along with the chanting of Vishnu Sahasranama. Moreover, she conducted study classes in Poothampalli House. 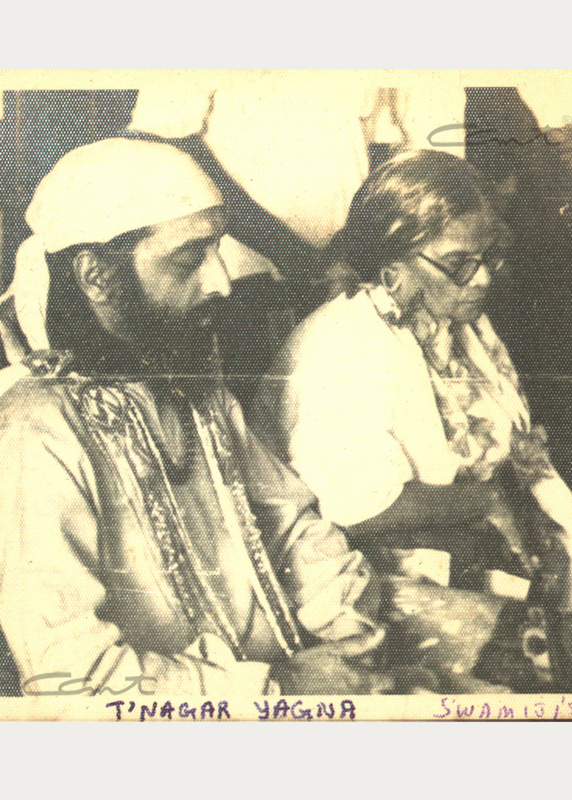 Swami Chinmayananda with his mother Kochu Amma on the right. 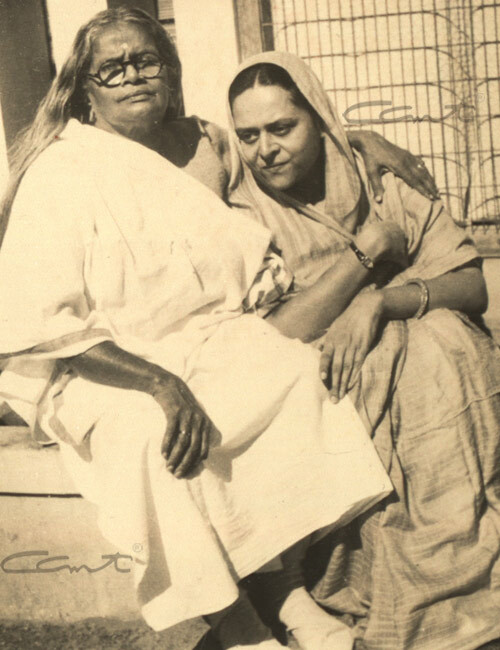 Swamiji served his mother tenderly and diligently, taking care of her needs wherever he could. 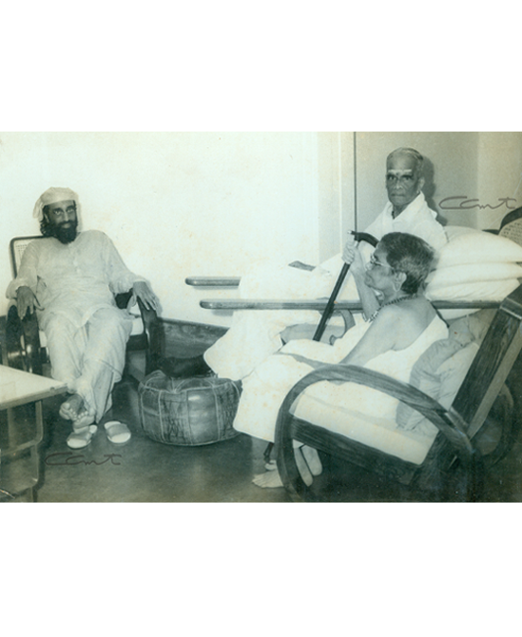 When she had to undergo a cataract surgery, he called her over to Coimbatore where he was conducting a yajna (sixth jnana yajna from 09.05.1954 to 30.05.1954), arranged for the surgery, stayed with her and served her personally. 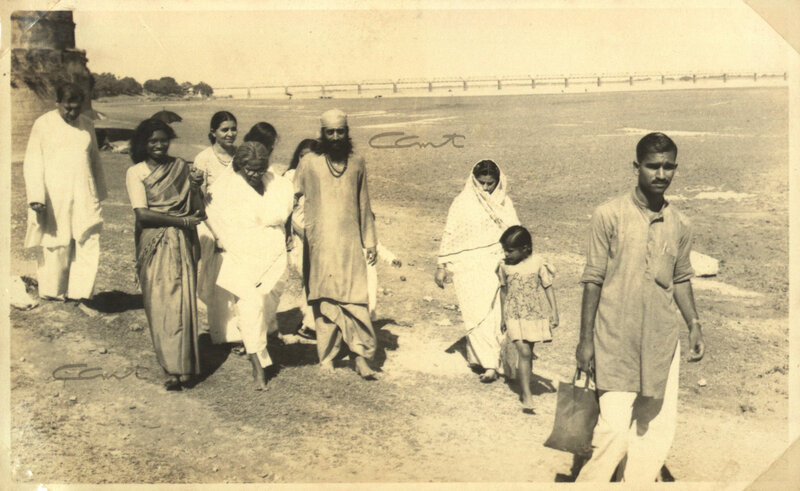 Swami Chinmayananda helping Kochu Amma to walk on the shore at Triveni Sangam after the Jnana Yajna in Delhi from 18.09.1955 to 28.10.1955. 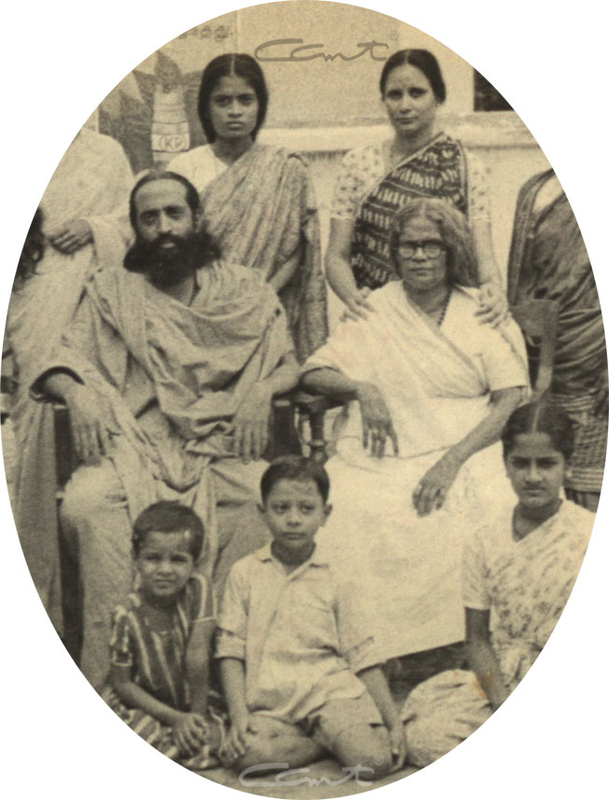 Swami Chinmayananda with his mother Kochu Amma on the left. Aunt Kutty Paru Amma is on the far right. 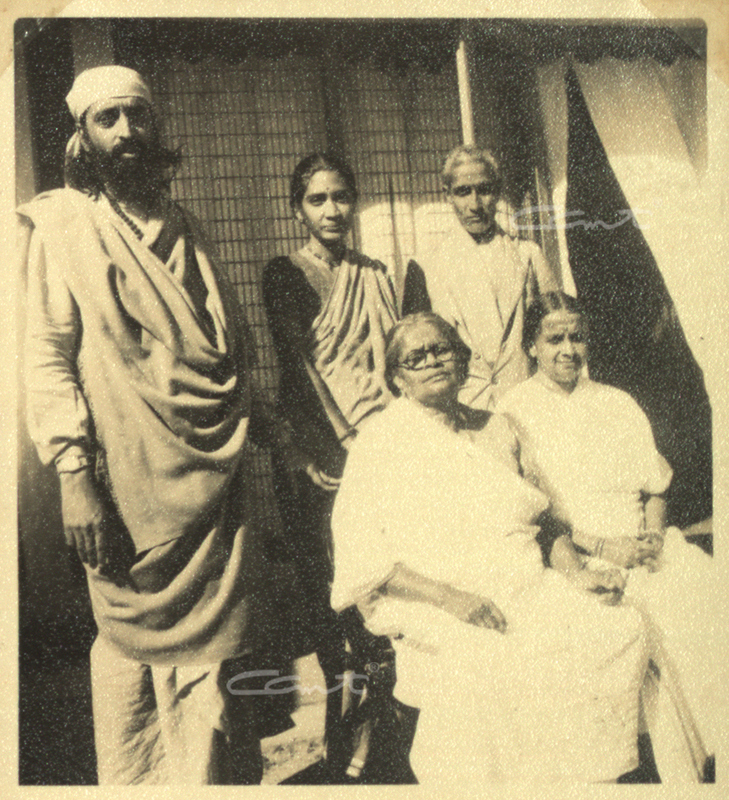 Swami Chinmayananda with his mother Kochu Amma (far right) and aunt Kutty Paru Amma (next to her) during the 14th Jnana Yajna in Delhi from 30.10.1955 to 30.11.1955. 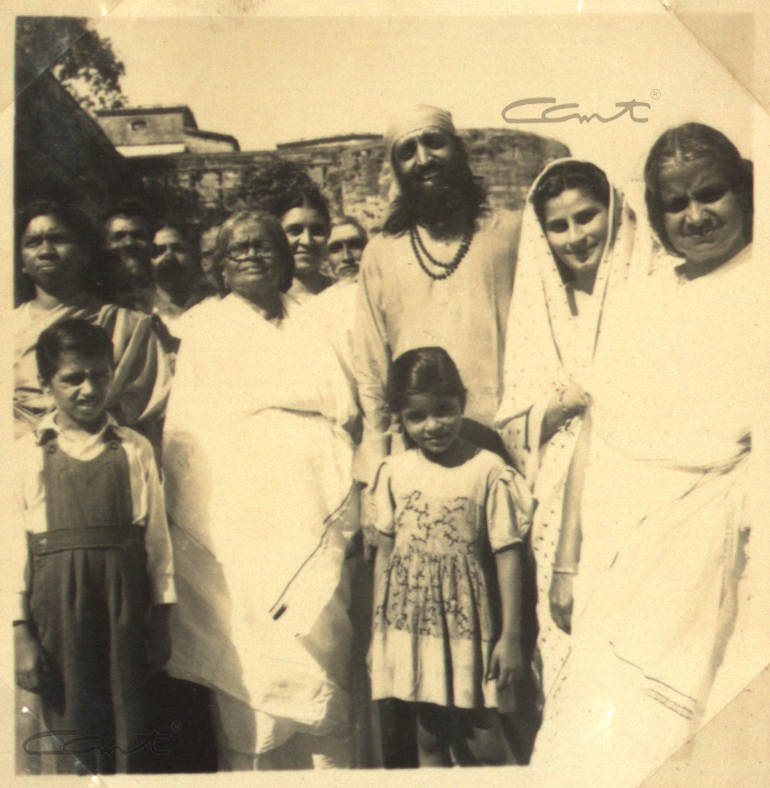 Gurudev with Kochu Amma and devotees in Ooty in 1955. 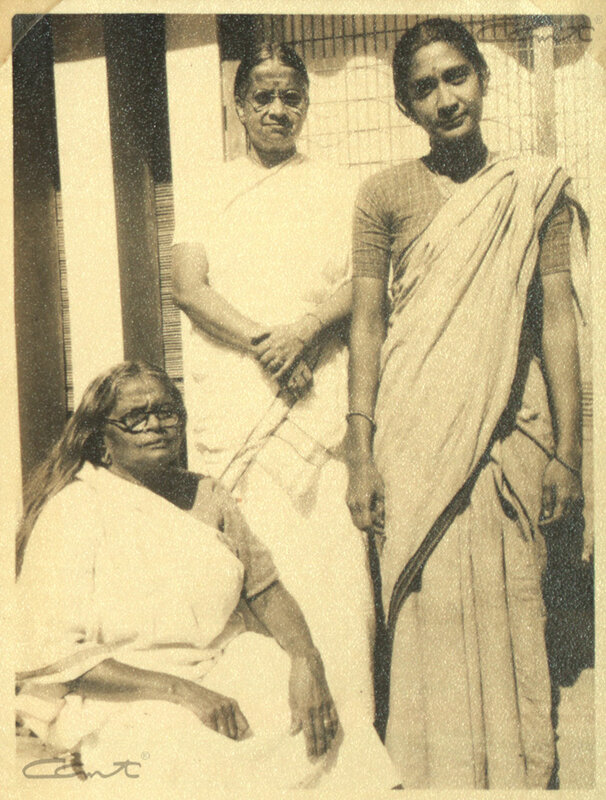 Kochu Amma with her younger sister Kutty Paru and unknown person during the 14th jnana yajna in Delhi from 30.10.1955 to 30.11.1955. Kochu Amma with Smt. 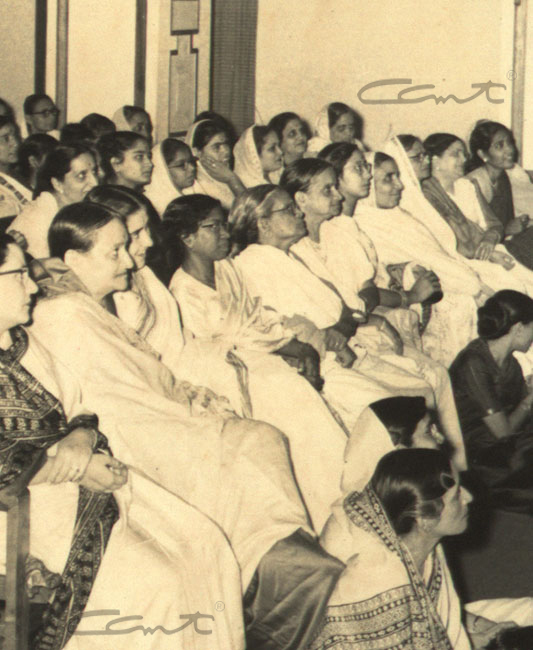 Atal from Calcutta during the 14th Jnana Yajna in Delhi from 30.10.1955 to 30.11.1955. 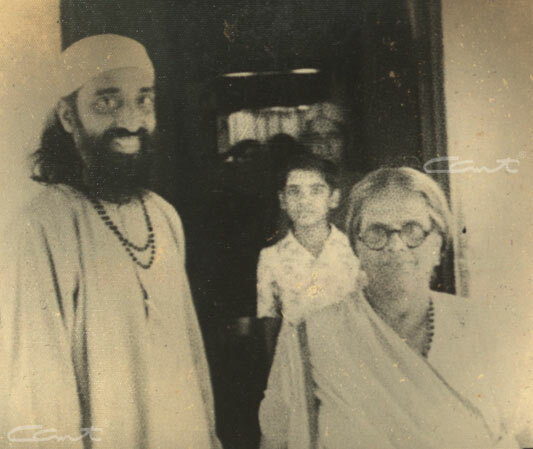 Kochu Amma and her brother Neelakanta Menon with Gurudev. The little child Balan loved Kochu Amma’s long and thick hair that flowed till her knees. He would often play with it. In her old age, she developed psoriasis and the doctors had advised that her hair should be cut short. When Swamiji visited her next and saw her with short hair, he was very upset and scolded the family members. 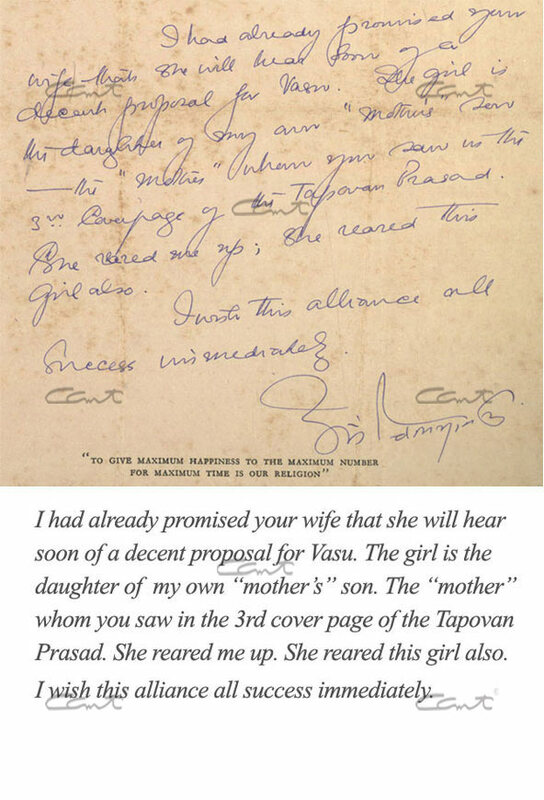 Excerpt from Gurudev's letter to Sri K.P.N. Nair dated 25-5-1966. 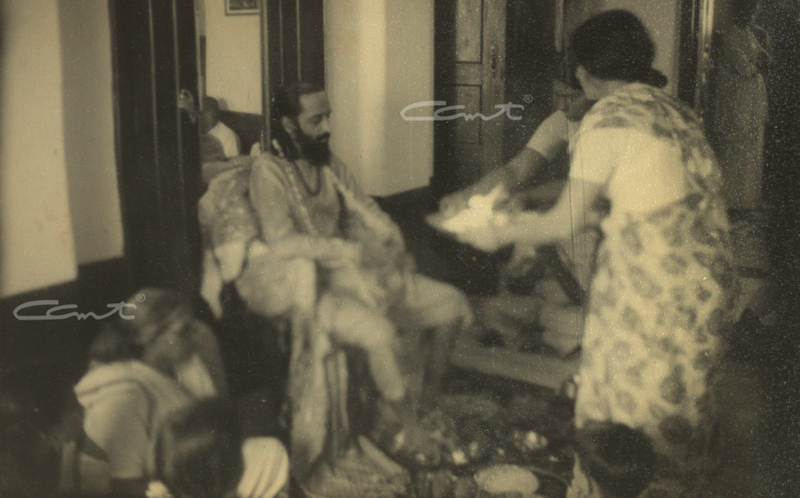 Pujya Gurudev with Kochu Amma garlanded for Pada Puja in Chennai, date unknown. Many were the occasions when Swamiji referred people to his mother, to be groomed in the traditional values and culture. 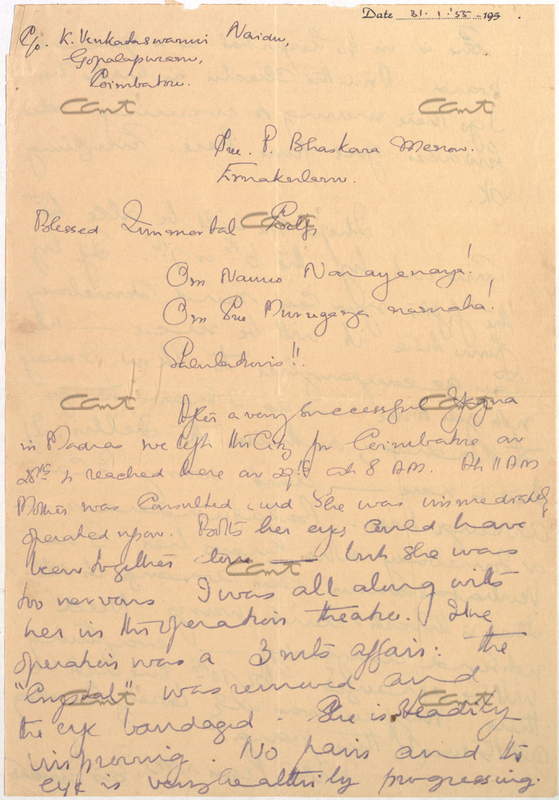 He sent Leela Rangaswamy (late Swamini Pavitrananda) to Poothampalli House to be taken care of by his mother. She made the young girl eat nourishing food and strengthened her body, as well as her mind. Listen to Leela’s sister Indira Rajaram talk about it. Kochu Amma passed away peacefully on March 26, 1967. 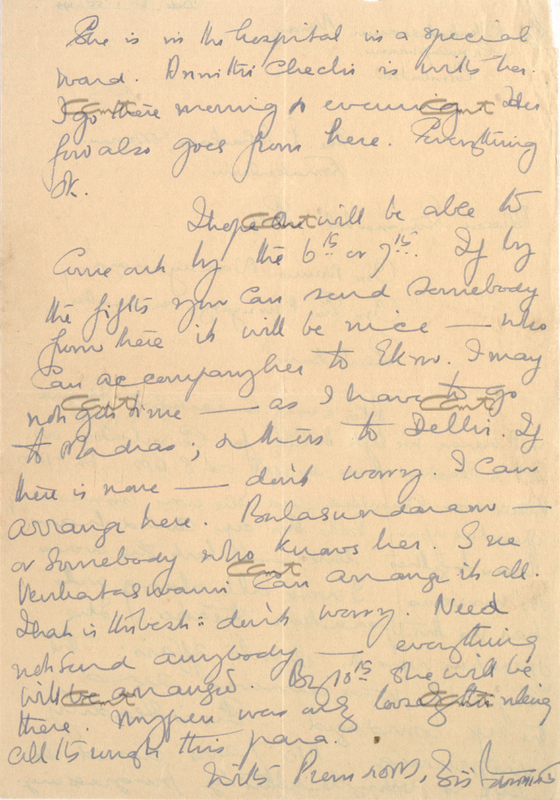 At that time, Sarasa was at home by her side and Indira was with Swamiji in Calcutta. 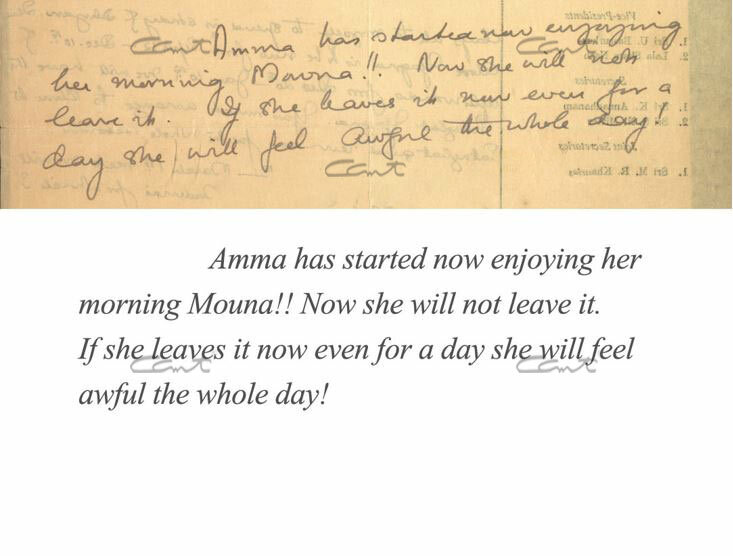 On hearing the sad news, Swamiji told Indira, “The whole of last night, I was with my mother.” Kulam pavitram janani kritartha – the entire family is blessed and the mother is fulfilled when a son attains such a high spiritual status. 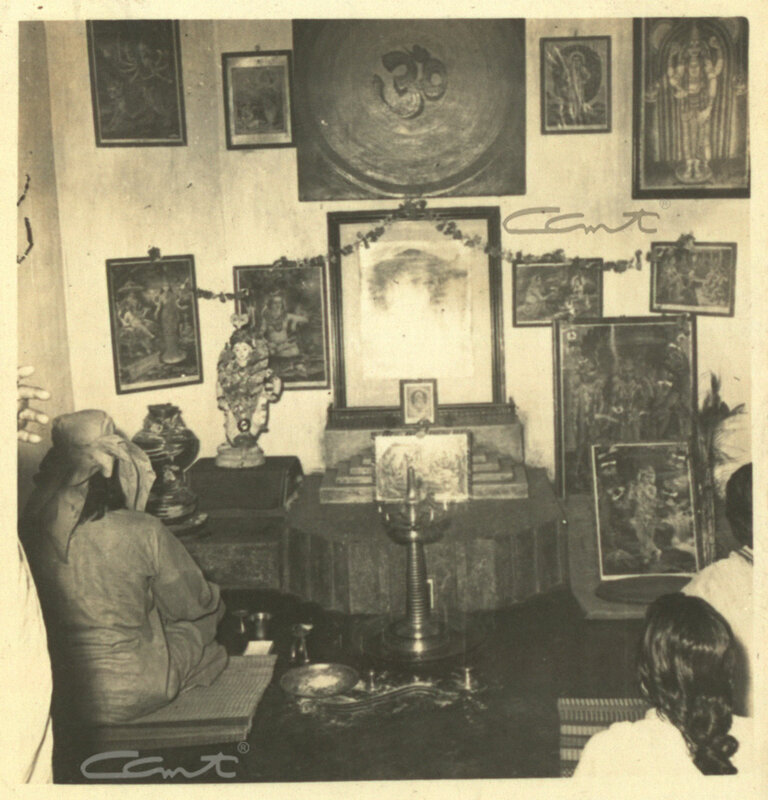 Pada Puja during the sixth Jnana Yajna in Coimbatore from 09.05.1954 to 30.05.1954. 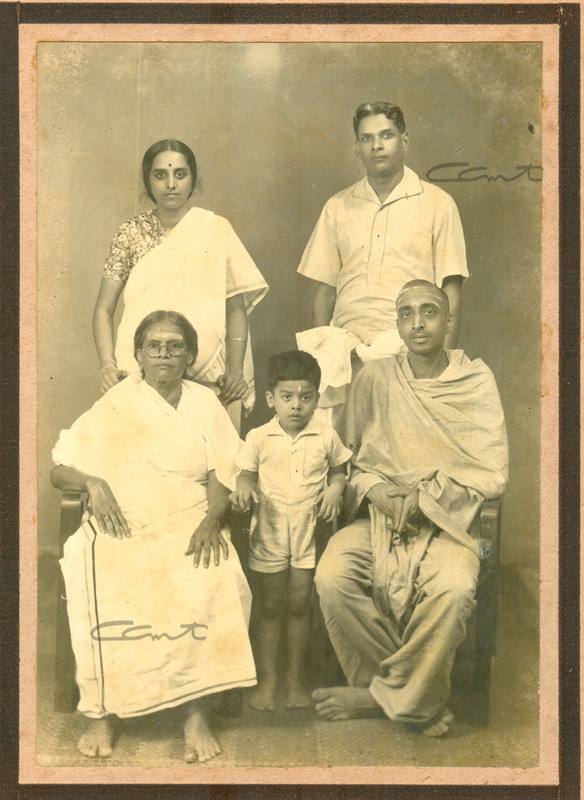 Kochu Amma is seated on the left. 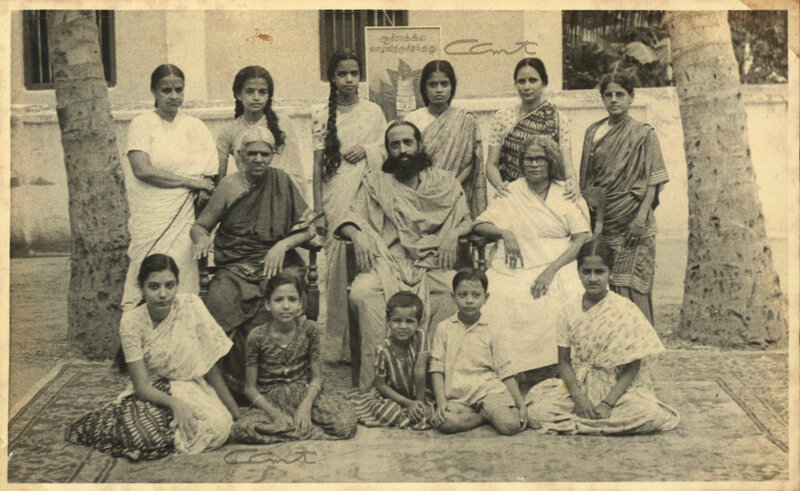 Pujya Gurudev with Kochu Amma seated next to him and others during the 14th Jnana Yajna in Delhi from 30.10.1955 to 30.11.1955. 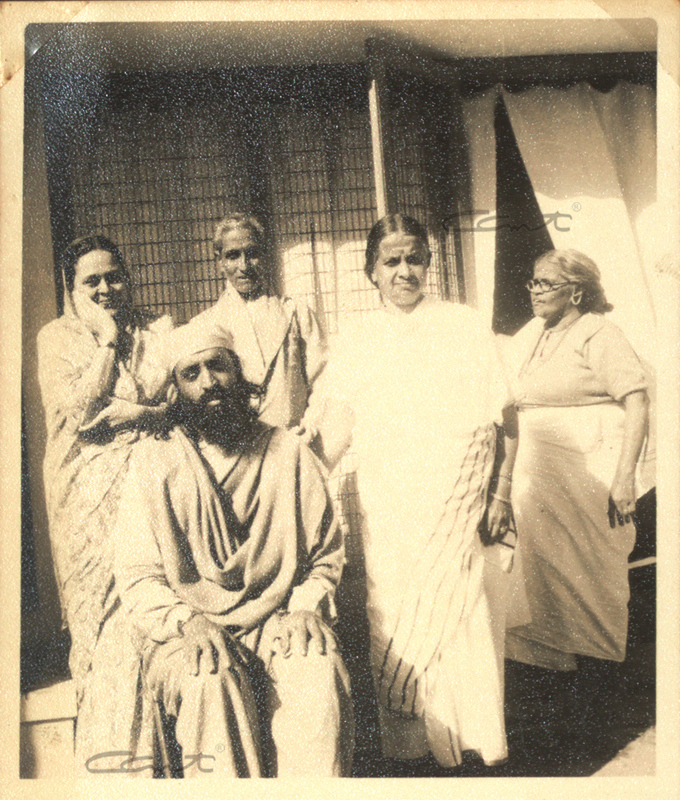 Kochu Amma with her sister Kutty Paru Amma (aunt of Swami Chinmayananda) and unknown person during the 14th jnana yajna in Delhi from 30.10.1955 to 30.11.1955. 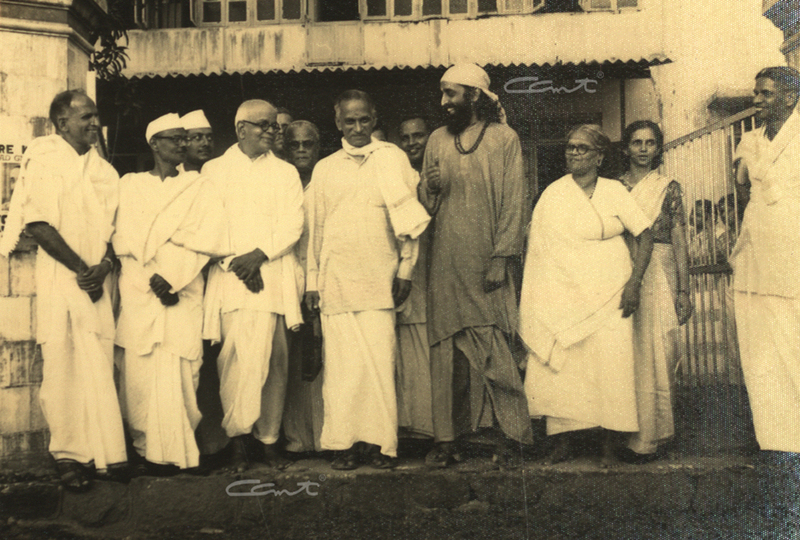 With devotees during the sixth Jnana Yajna in Coimbatore from 09.05.1954 to 30.05.1954. 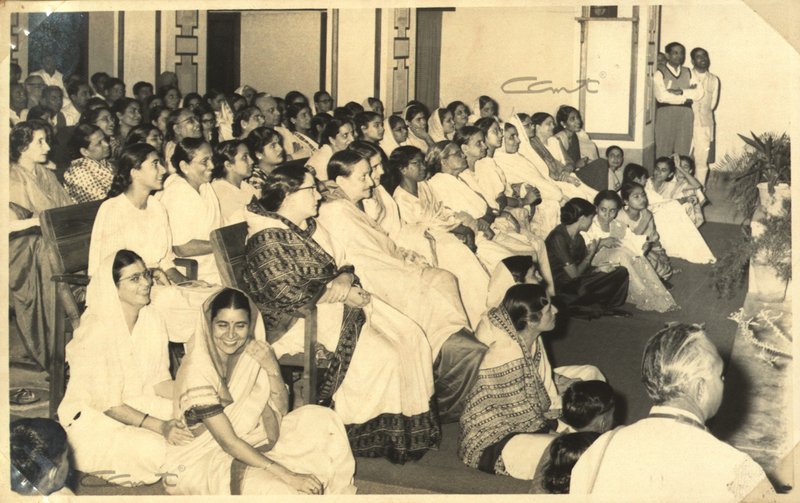 Kochu Amma is seated to the right of Gurudev. Aunt Kutty Paru Amma is standing in the back row, extreme left. 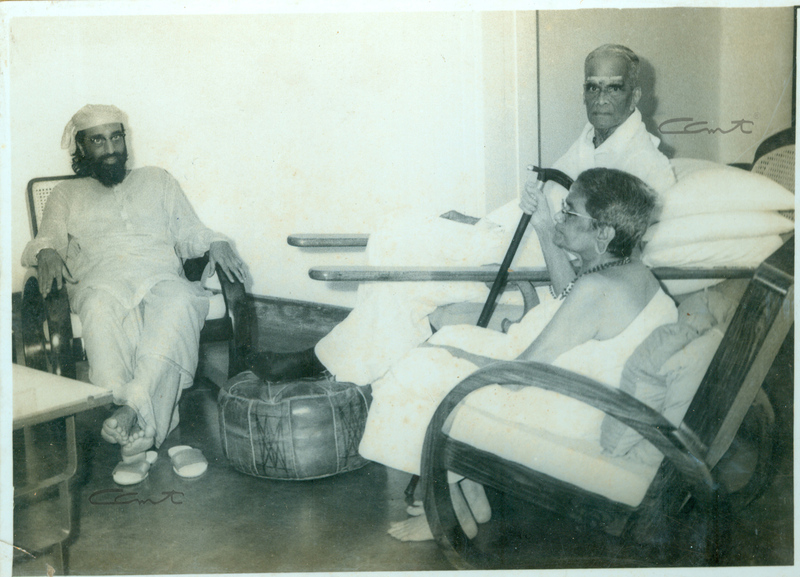 Pujya Gurudev with family members in Poothampalli House. 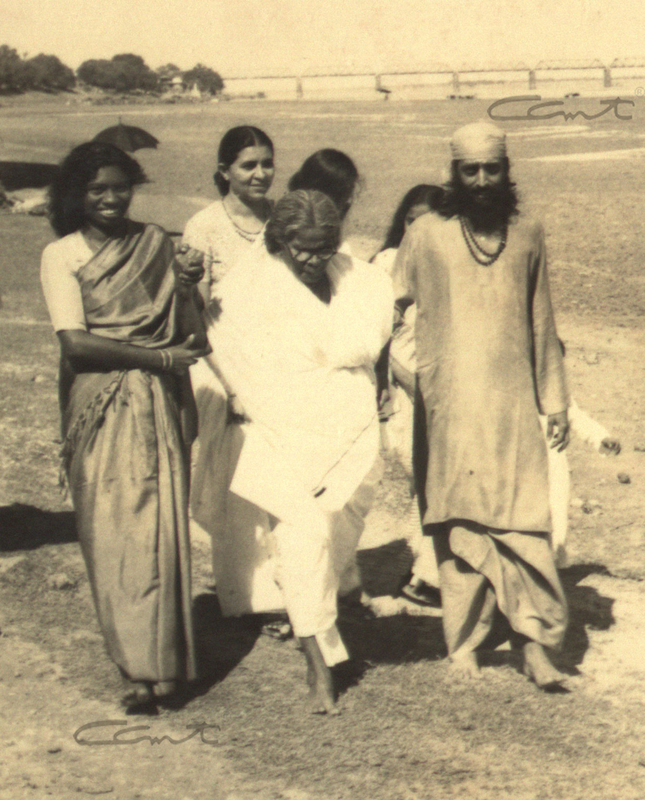 Left of Gurudev is Padmini (his younger sister), and Kochu Amma. 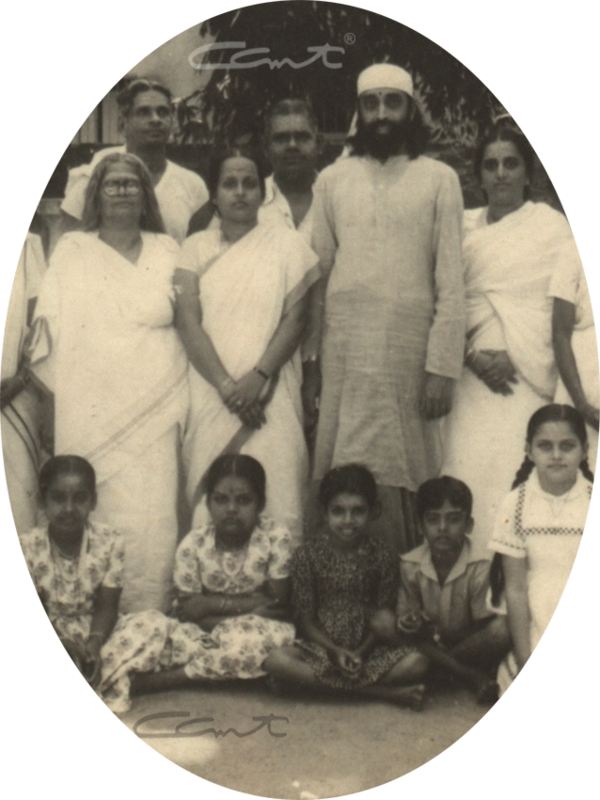 On the right of Gurudev is Kanakam (his youngest sister).